Meadowview Biological Research Station’s Central Virginia Preserve is located adjacent to the Re-search Station in Caroline County, VA. Meadowview has formed a strategic plan to acquire a series of target properties. The goal is to protect the northern most pitcher plant population in Virginia We’re off to a great start! In May 2010, Meadowview purchased the first tract of interest from Margie and Phil Sheridan. The “Sheridan Tract” abuts the Meadowview operations center. The land is characterized by sandy loam soils, a mixed pine hardwood forest, and bubbling sphagnous springs. The 3 acre property appraised for $20,000, the board then voted and approved the purchase (Phil Sheridan recused to avoid conflict of interest), and the tract was purchased for $19,000. Union First Market Bank in Bowling Green, Virginia provided fi-nancing. We only have a balance of $5,600 remaining on this loan. The 14 acre “Gatewood Tract” boasts the headwater of the native purple pitcher plant bog above Meadowview. When the property became available for purchase in 2010, Meadowview member Dr. Ernest Wilson (at right), came forward and purchased the property for $95,000. Meadowview then signed an exclusive lease to own contract with Dr. Wilson. This partnership allows restoration work to proceed and provides confidence that the bog’s head-waters are protected. 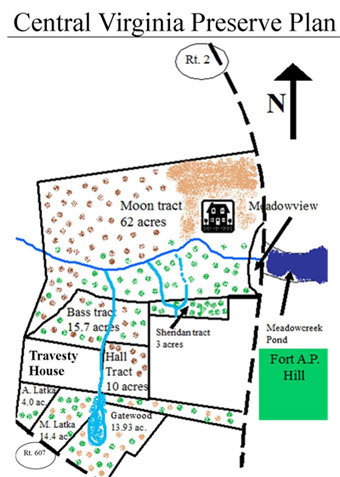 In January, 2011, Meadowview member Bill Scholl signed a sales contract on the 15.7 acre “Bass Tract” for $59,000, and Meadow-view signed a lease to own contract with Mr. Scholl. This acquisition is now delayed due to a title issue with the seller. We hope to be able to proceed with the purchase contract and protect this important pre-serve parcel with crystal clear springs and hardwood forest. Stay tuned. Meadowview member Jon Davis is underwriting a lease of the native pitcher plant bog on the Hall tract ($100/month). The lease allows us to enter and work on the 3 acres of bog on this property harboring the northern most purple pitcher plant bog in Virginia. Controlled pollinations of the native S. purpurea on the Hall tract have resulted in almost 90 seedlings. These plants are undergoing intense propagation at Meadowview for return to the Hall tract and introduction to seeps on the Gatewood/Wilson tract. Central Virginia Preserve Grant Awards. Virginia Land Conservation Foundation (VLCF) Award: The VLCF awarded Meadowview a matching grant of $56,500 in 2011 towards the purchase of the Gatewood and Sheridan tracts. The agreement was exe-cuted in Dec. 2011 and we have two years to raise the matching funds. To date we have raised $13,400 in donations (money applied to the preserve note which is eligible match equity) and still need to raise another $44,000 within the next year to obtain the grant funds. Both properties will be permanently protected by a con-servation easement which our county, Caroline, has agreed to accept, providing matching funds are raised. The Community Foundation of the Rappahannock River Region Award: Meadowview was awarded the Duff McDuff Green Jr. grant in both 2010 ($2500) and 2011 (10,000). The grant has funded complete restoration (invasive hardwood removal) of the Sheridan tract, trail completion on Sheridan and Gate-wood/Wilson tracts, signage, bench seating, and tree pruning equipment.